In this chapter, we shall introduce a general strategy for inductive modeling, a strategy that will allow us to model systems with totally unknown meta-laws. Of course, models so constructed will not offer the same degree of validity as deductively constructed physical models and it will be important to discuss how the validity of these models can be assessed. While the methodology can be used to construct models in a completely inductive manner, it will allow us to incorporate in our model any physical insight that we may possess about the functioning of the process under investigation. The methodology has been coined System Dynamics. This is unfortunately somewhat of a misnomer. Haven’t we been discussing the “dynamics of systems” in this book all along? Didn’t I reference in Chapter 4 a book entitled System Dynamics that talks about simple electrical and mechanical systems? In this new context, “System Dynamics” denotes a specific semiphysical and semiinductive modeling methodology. 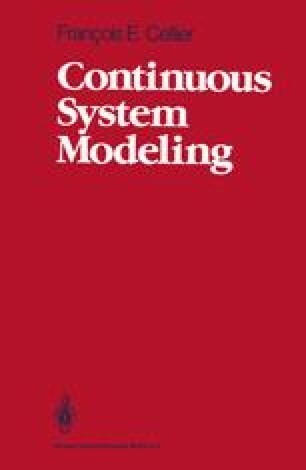 To minimize the confusion, from now on, I shall always capitalize the term “System Dynamics” when I refer to this particular modeling methodology and not capitalize it when I refer to the dynamics of systems in general.